The Omega Seamaster Planet Ocean 600M checks all the right boxes both as an everyday sporty luxury watch, as well as a robust diving instrument. It’s surprising to think that the Seamaster Planet Ocean collection has only existed for a dozen years. Given its recognition, credibility, and popularity, it feels like it’s been around for a lot longer than that. In fact, the Seamaster Planet Ocean is a bit of a celebrity in the world of luxury watches. And with looks and capabilities like these, it’s not surprising. Let’s dive in and explore. 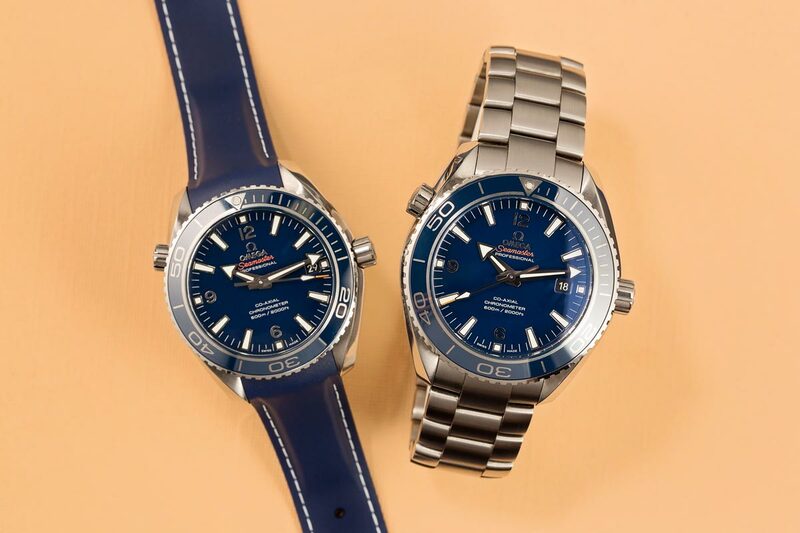 Which strap do you prefer on the Omega Seamaster Planet Ocean 600M. 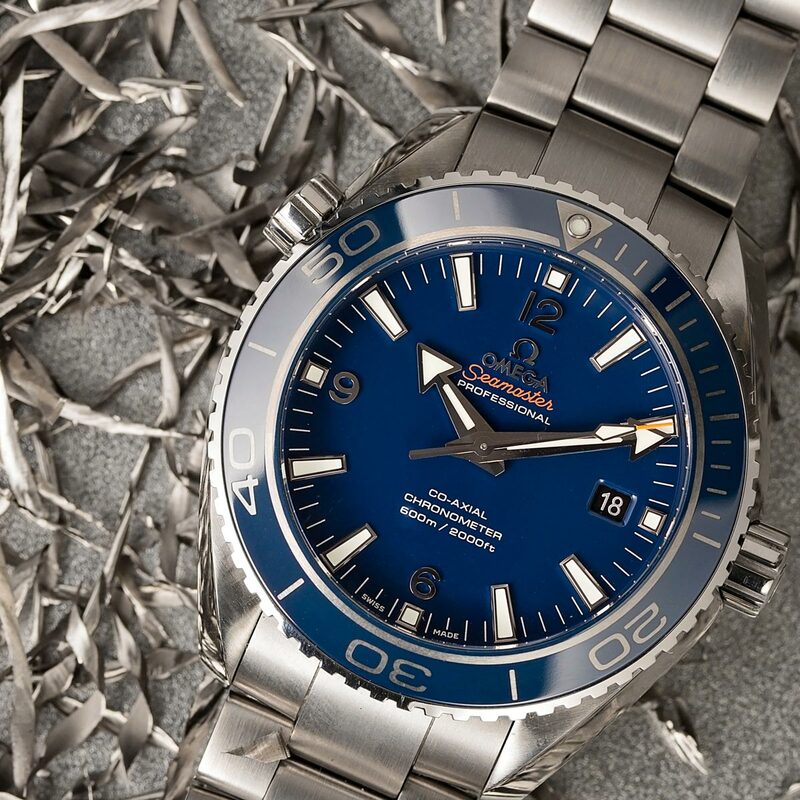 While the Planet Ocean may be somewhat of a newbie, the Seamaster line has been around since 1948. Therefore, the Seamaster is the oldest Omega collection still in production today. When it was first presented, the Seamaster was offered as an elegant dress watch that could handle some splashing. For gentlemen who had fine tastes and an active lifestyle. 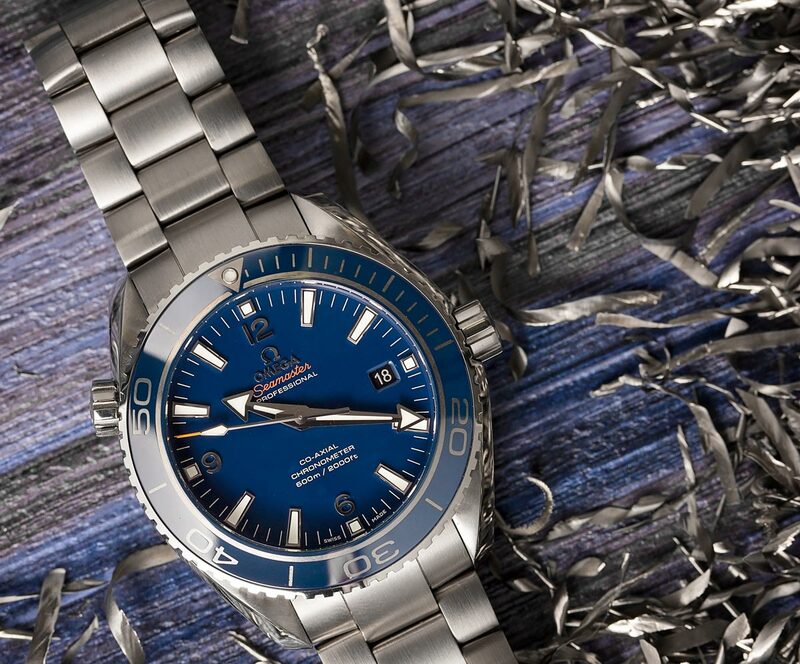 Today, the Seamaster collection includes a wide assortment of water ready timepieces from the elegant Aqua Terra to rugged tool watches like the Planet Ocean. However, that spirit still remains; Omega Seamaster watches are robust timepieces for those with fine tastes. 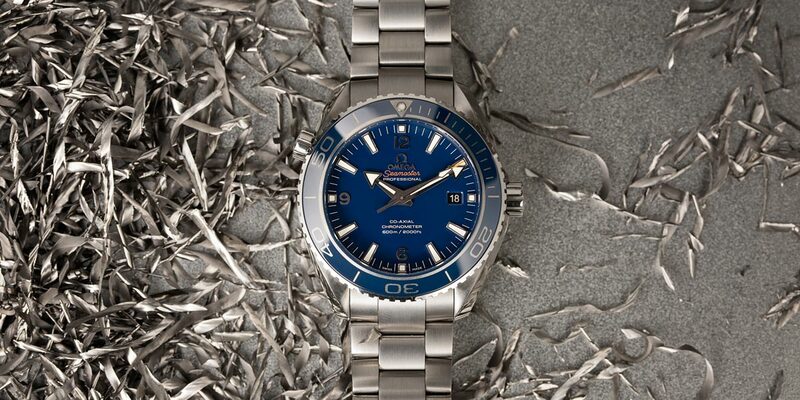 The Seamaster is the oldest collection from OMEGA. Take for example this Seamaster Professional Planet Ocean 600M ref. 232.92.42.21.03.001. Part of a larger family of PO watches in a multitude of size, materials, and colors, this particular model is an ultralight version. Crafted in titanium, this Planet Ocean sports a 42mm case along with a blue Liquidmetal—Omega’s proprietary alloy—ceramic bezel. Compared to its 45.5mm counterpart, this 42mm case is a more restrained approach to an everyday luxury sports watch. The matching blue dial is home to large double broad-arrow hands, baton indexes, and silver Arabic numerals at 6,9, and 12. The Omega Seamaster Planet Ocean 600M also features a ceramic bezel. The blue and titanium version of the Planet Ocean 600M is especially sporty thanks to its blue rubber strap. Omega’s high-quality rubber strap is famously comfortable to wear. It’s also especially attractive thanks to the white stitching on the blue material. There’s also the matching titanium deployant clasp that keeps everything securely in place. As its name suggests, the Planet Ocean 600M is built to explore marine landscapes, boasting water resistance to 600 meters deep. While this titanium and blue Seamaster Planet Ocean looks great ashore, let’s not forget it is a diving watch. From its unidirectional rotating bezel and powerful lume to its helium escape valve, the Seamaster Professional Planet Ocean 600M ref. 232.92.42.21.03.001 was born to dive. As a diving tool the Seamaster can dive down to 600M. While it’s customary for dive watches to have a solid caseback to keep the water out, Omega managed to have a transparent caseback for all to admire the Cal. 8500 working away within. Caliber 8500 is Omega’s in-house automatic mechanical movement that offers 60 hours of power reserve. Beautifully decorated with arabesque Geneva waves, the movement comes equipped with the famous Omega Co-Axial escapement. Plus, there’s also the free-sprung balance, a pair of barrels mounted in series, and bi-directional automatic winding. It also features a clear caseback to see the movement. From overboard to starboard side to boardroom bound, the Seamaster Planet Ocean is a fine choice for a luxury diver’s watch. 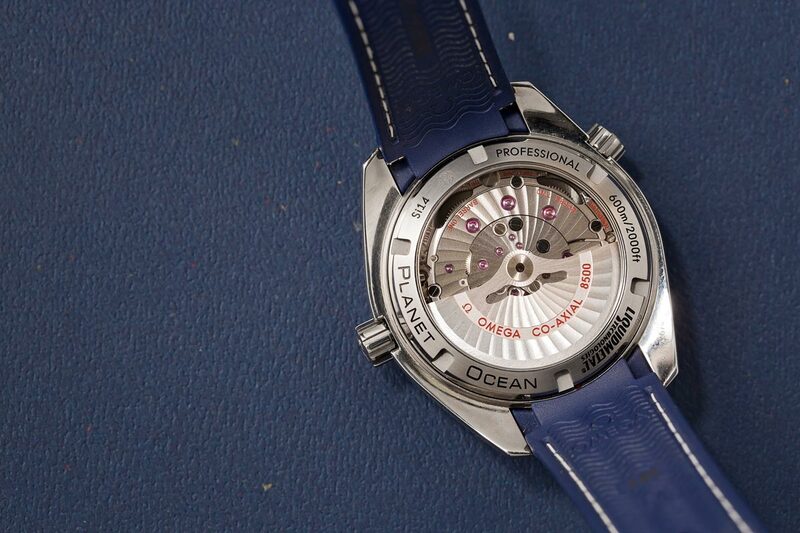 What do you think of the Seamaster Planet Ocean? Do you like this particular model with a titainum case and blue details? Share your thoughts with us in the comments section below.